We are now into our twelth season & we are very pleased to say that we have had some truly lovely guests staying at Casa Rosa, many of them returning again and again, here are just a few of their recent comments. We spent a wonderful week in Bugnara. 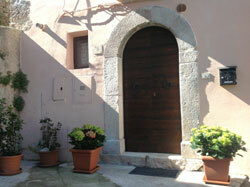 We stayed at Joanna's lovely Casa Rosa in mid August, when Italians celebrate Ferragosto. Joanna is an amazing host, and her house a little gem with a very nice and cozy garden. She constantly kept in touch and gave us every bit of information. Casa Rosa was spotless and very well equipped. We always had breakfast in the shade of the garden under a wonderful blue sky. At night we found some relief from the heat of those August days at Gino's. A deserved reward after those hiking tours in the gorgeous Maiella Park. Also, Bugnara is a quaint small village close to the more famous Sulmona and three national parks. People there are very friendly and have a sincere warmth, rare to find in the traditional tourist destinations. We found everything we needed. We will be definitely coming back!